I explain and illustrate my no dig principles, so you learn how to create a productive garden yourself, even when a beginner. Weeds are often a major problem but clever mulching allows your plot to stay clear of them, including couch grass and bindweed. This saves time, reduces slug damage and makes everything more enjoyable. Especially weeding. Experienced gardeners learn many time-saving methods and see ways to increase the growth and health of their plants. The day includes a lunch of many vegetable dishes, created by my partner Stephanie Hafferty. Her recipe book is in the website shop, along with my books, dibbers and no dig mugs. Preparing ground and making new beds is possible at any time. 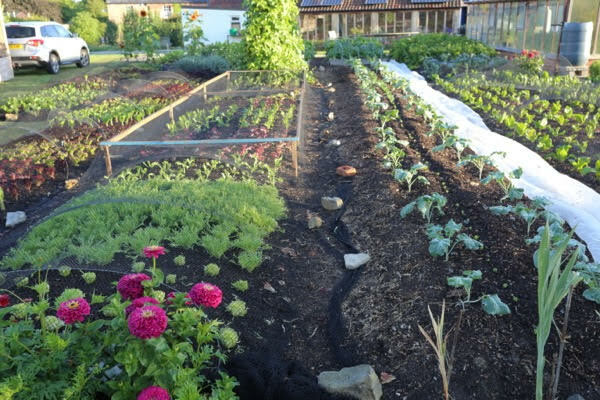 I use Homeacres garden to illustrate the joys of no dig growing and how abundant it can be. There is plenty to learn from what is growing, both outside plus in the greenhouse and polytunnel. You see a few of the spring’s plantings while many have finished, so August is partly like a second spring in the garden. Already there are second plantings growing, or ready to plant. I explain about interplanting. Part of the course is about compost making, using the examples of my composting process here. Which ingredients are good to use, in what proportions, how big a heap to have, whether it needs to get hot, how long to leave it and whether turning is worthwhile. Then a look at assessing the readiness of compost, when to spread it and how to deal with the weed seeds. In addition we look at other types of compost and the best ones to buy, plus how long you may or may not need to keep them in a heap before spreading. You learn the details and simplicity of surface composting to feed both soil and plants for a whole year, in one dressing and with no other plant feeds needed. Finally we look at propagation and I show you composts, module trays, sowing methods and suggest timings. You see the greenhouse still has seed and module trays benefiting from its sheltered environment and pest protection. There will be seedlings of lettuce, chicory, kale and new sowings of spinach, rocket and mustards. For more details on what is covered please see my Courses page. Our price includes VAT, lunch and all refreshments.